Under the branch of a tree, a wolf is relaxing, stretched out while watching the horizon beyond. The Tree over head offers little shade yet seems to watch over him. This Amulet offers a scene rather than a simple profile or face. The idea here is to present an aspect of the Wolf rarely depicted in the amulet form. Originally created in 1989, this has been one of the more interesting shapes I have created. Completely a-symmetrical in shape it describes a moment in the Wolf’s life he (or she) isn’t hunting, playing, fighting nor sleeping. Rather the wolf surveys the land with reposed interest. Ready to respond at a moments notice, yet reclined in comfort as if watching pups at play or simply enjoying a sunset. The Watchful Wolf Amulet is designed for those lovers of the Wolf who are a bit more relaxed and ready to enjoy life yet ready to respond when needed. 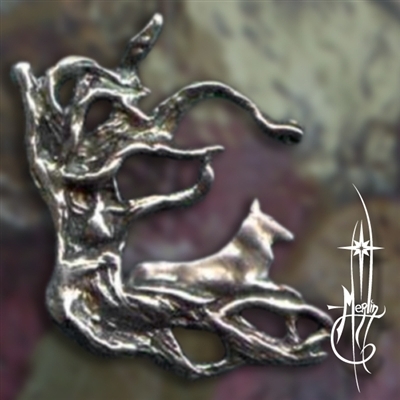 Wolves being pack minded and concerned with their community, this amulet is for those concerned with their families, their community and their planet. Is the wolf sterling silver or pewter? Silver, I do not work in pewter.